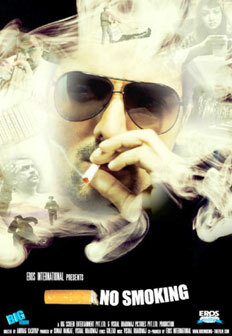 A surreal psychological thriller written and directed by Anurag Kashyap. Produced by Vishal Bharadwaj, Kumar Mangat Pathak. I played K, an arrogant chain smoker. When K agrees to kick his habit in order to save his marriage, he visits a bizarre rehabilitation centre recommended by a friend. However, he is then locked into a nightmarish game with Baba Bengali, the man who has guaranteed to make him quit. Fantasy and reality start to blur together as K endures his 'treatment'. "When Anurag narrated the story to me I loved the idea and I was sure I was going to do the film. Anurag is a genius. In the middle of a scene, he can change a word or twist the body language and make it look good. I'd love to work with him again. I still believe that 'No Smoking' is my best performance till date."